"Deck the halls" with all things Stampin’ Up! including stamped images from the Holiday Happiness Set, Pearl Basic Jewels, Designer Buttons, and Clips Assortment. Fewer things invite the special feelings of the Christmas season faster than a Christmas tree with all the trimmings. 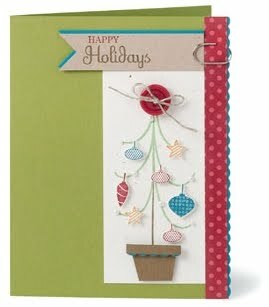 This 6 piece stamp set lets you trim your own trees with dashing ornaments to evoke those festive feelings! I really love the details you put. Thank for sharing.